This Neolithic chambered cairn from Embo in SE Sutherland is arguably the most accessible example in the Highlands for those with a car. 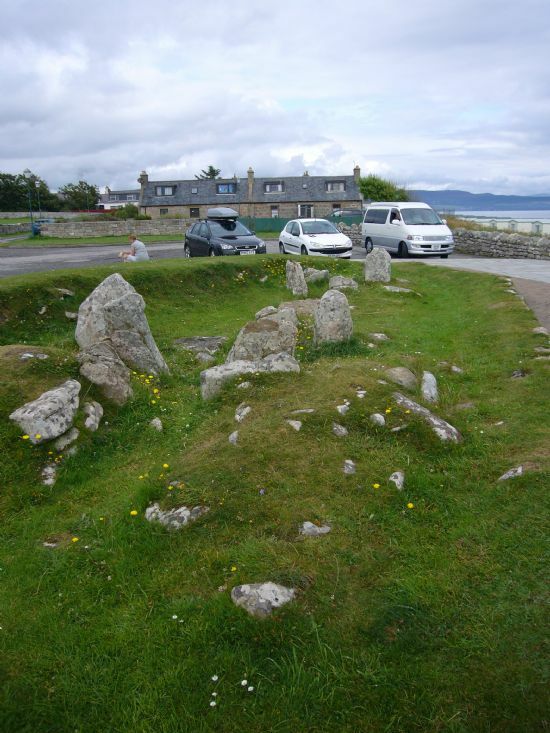 Situated in the car park of ‘Grannies Heilan' Hame’ Holiday Park on the coast, it was excavated when the car park was created in the 1960s, and the remnants preserved in an island. Only the foundations remain, providing a good idea of the layout of such cairns. The excavations revealed useful evidence about the construction of the corbelled chambers. The cairn is of the ‘Orkney-Cromarty’ type, common in the eastern Highlands. The mound contained two chambers, and had already suffered some disturbance before the excavations took place. From the southern entrance, a short passage led to an antechamber (or perhaps simply the passage) and then the main chamber where at least six adults and nine children were buried. The chamber had been filled in at a later date, and later disturbed in the 1950s, hindering detailed interpretation. The second chamber was entered from the north. It too had been much disturbed, and included a number of animal bones, though only a few examples of each species. The fact that the chambers are back to back, not identical and are on slightly different alignments suggest that the northern chamber is later, perhaps added as the first was nearing completion. 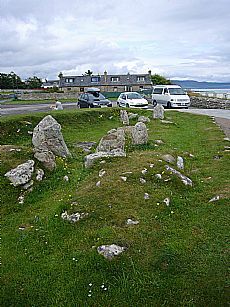 Neolithic chambered cairns appear to have been reused for a number of burials and ritual over a period of time. The trampling within the chambers of the Embo cairn suggests that many visits took place to the tombs. The incompleteness of some skeletons lends support to the theory that some bones were deliberately removed, perhaps for handling. Although it is not uncommon for Neolithic burials to contain animal bones, the range of species at Embo is noteworthy. Like many of the Highland Orkney-Cromarty cairns, the site remained a focus for burials into the Bronze Age. Two stone cists were inserted into the mound in the early Bronze Age. One remains in the centre, between the two chambers, and contained remains of two babies, a food vessel and a beaker for holding drinks. The second cist, originally in the southern chamber but now removed, contained a woman with a necklace of jet or cannel coal beads and a food vessel. A number of other later Bronze Age cremation burials were added, both in the cairn and in the area around, some also with wealthy gravegoods including a bronze razor. The finds indicate a population in the area over millennia, and certainly in the Bronze Age, one with access to high status objects. Henshall, A.S. and Taylor, H W Y. 1956-7. 'A Bronze Age burial at Embo, Sutherland', Proceedings of the Society of Antiquaries of Scotland, Vol 90 (1956-57), pp 225-7. Henshall, A.S. and Wallace, J C 1962-3. 'The excavation of a chambered cairn at Embo, Sutherland', Proceedings of the Society of Antiquaries of Scotland, vol.96, 9-36. Henshall, A.S. and Ritchie, J.N.G. 1995. The Chambered Tombs of Sutherland. Henshall, A.S. and Ritchie, J.N.G. 2001. The Chambered Tombs of the Central Highlands.